Photo of Badme Library of University of Ghana, Accra, Ghana by Rjruiziii, licensed under the Creative Commons Attribution-Share Alike 3.0 Unported. Ghana is a medium-size country in West Africa bordering Burkina Faso, Côte d’Ivoire, and Togo. Like many African countries, it’s a diverse, multilingual nation—around 50 indigenous languages are spoken throughout the country, the most widespread of which is Akan, the language of Ghana’s largest single ethnic group of the same name. However, English is the lingua franca and official language spoken by at least half the population. It is also the formal language of instruction at all levels of education, although indigenous languages are also used in elementary school, depending on the region. Not a given in Africa, Ghana is a democracy that holds free and largely fair elections. While Ghana is a much less populous country than large sub-Saharan states like Nigeria, Ethiopia, or the Democratic Republic of the Congo, it faces the same challenges in providing economic opportunities and education to its fast-growing population. The country’s populace has doubled within just three decades, from 14.2 million people in 1989 to 28.8 million in 2017 (World Bank). At 2.5 percent, the present population growth rate in Ghana is far above the global average. The country is gaining another 700,000 to 800,000 people each year—a trend described as “alarming” by some observers. On the upside, with nearly 39 percent of the population under the age of 15 (in 2016), Ghana has a window of opportunity to harness a formidable “demographic dividend,” as long as it can adequately educate its young people. To help achieve this goal, the Ghanaian government in 2017 announced that it was making secondary education tuition-free throughout the country. President of Ghana Nana Addo Dankwa Akufo-Addo promised, “There will be no admission fees, no library fees … no examination fees…. There will be free textbooks, free boarding and free meals.” While a heavy burden on Ghana’s constrained budget, these measures continue a long tradition of progressive public policies that have helped make education in Ghana more inclusive. They also set an example for other West African countries like Sierra Leone. Ghana’s accomplishments in advancing access to education over the past decades have certainly been impressive. The country’s youth literacy rate, for instance, jumped from 71 percent in 2000 to 86 percent in 2010. Ghanaian children now attend school in higher rates than their counterparts in many other African countries, as well as in developing nations in other world regions. While more than 84 percent of children participated in elementary education in 2017, the gross enrollment rate (GER) in secondary education increased from 57 percent in 2012 to 73 percent in 2017, compared with 42 percent in Nigeria, 45.5 percent in Pakistan, and 65 percent in Jordan. Education spending in Ghana has been high in recent years, even though public expenditures on education recently dropped from a record peak of 8 percent of GDP in 2011 to 4.5 percent of GDP in 2017. These improvements come amidst a solid performance of Ghana’s economy, which has been the second-fastest growing in Africa after Ethiopia’s in recent years. Called the “Gold Coast” during the time of British colonial rule from 1867 to 1957, Ghana is a country rich in natural resources, including the sixth largest oil reserves in Africa, which have helped propel economic growth. Ghana’s GDP grew by 8.5 percent and about 6.2 percent in 2017 and 2018 respectively, and is anticipated to continue to grow by another 6 percent in 2019. Parts of the population are also becoming increasingly affluent: “Ghana is one of just six countries in sub-Saharan Africa in which the middle class – composed of individuals with a daily income of at least $8.44 – exceeds…” one million people. In education, significant problems persist in the form of critical shortages of trained teachers, classroom facilities, and learning materials, particularly in rural regions. The recent introduction of free secondary education was an attempt to curb high dropout rates in Ghana’s schools. A reported 100,000 children do not transition from basic to secondary education each year because their parents cannot afford the costs. Furthermore, literacy standards and learning outcomes often remain poor, despite increased enrollment rates in recent years. About 70 percent of high school students, for instance, failed the final senior secondary West African Examination Council exams in 2014. And gender inequalities and disparities in access to education between rural and urban regions are severe. Despite its skyrocketing over the past decades, the tertiary net enrollment rate also remains low and stood at only 17 percent in 2016—higher than the sub-Saharan African average of 9 percent, but less than half that of the Philippines or Indonesia, for example. Prospects for increased tertiary attainment rates aren’t helped by the fact that unemployment among university graduates is so high, there was a formal “Unemployed Graduates Association of Ghana”.Despite these problems, Ghana’s education system is in good condition overall compared with those of many other sub-Saharan African nations, but the country faces daunting challenges in providing inclusive, high-quality education to its youth, especially given its rapid population growth. While being dwarfed by the much more populous Nigeria, Ghana has become an increasingly important sending market of international students in the sub-Saharan region over the past seven years. The number of Ghanaian students enrolled in degree programs abroad climbed from 8,964 in 2012 to 12,559 in 2017 (UIS) – an increase of 40 percent. Economic development, rising income levels, population growth and demand for higher education, are factors that likely contribute to student mobility from Ghana, as are existing quality shortcomings in domestic higher education and the fact that the English language abilities of Ghanaians facilitate study abroad. While competition over the limited number of available slots at Ghana’s public universities is fierce, most private institutions are of lackluster quality – a situation that creates incentives for study abroad, especially among more affluent Ghanaians. High youth unemployment and a lack of economic opportunities are other push factors driving young Ghanaians overseas. Increased availability of scholarships for African students, including Ghanaians, no doubt also plays a role. Study abroad scholarships for students from Ghana are provided by the Ghanaian government, as well as by countries like China, Germany, Japan, and Russia. China, for example, has funded more than 1,000 scholarships to Ghanaian students. The United States is the most popular destination country of Ghanaian degree-seeking students overseas, followed by the United Kingdom, Ukraine, Canada, and South Africa. UIS data show that student inflows from Ghana to the U.S. have expanded significantly since 2000, and that the number of Ghanaian students is now almost twice as high as in 1999. Open Doors data of the Institute of International Education, indicate that Ghana is now the third-largest African sending country of international students to the U.S., with 3,213 students in the 2017/18 academic year (an increase of 3.3 percent over 2016/17). The only African countries that send more students to the U.S. are Nigeria and Kenya, other English-speaking countries that have similar push factors. About 48 percent of Ghanaians in the U.S. are enrolled in graduate programs (vis-à-vis 35 percent in undergraduate programs). This is mirrored by relatively high academic attainment levels among Ghanaian immigrants in the U.S. in general. According to a recent study by the Migration Policy Institute, 12 percent of Ghanaians held a graduate degree compared with 11 percent of the overall U.S. population. Unsurprisingly, Ghanaian students tend to prefer English-speaking study destinations like the U.S. or the U.K., with the latter hosting 1,300 degree-seeking students in 2017. However, while four out of the top five study destinations are English-speaking, other destinations have grown in popularity as well. The number of Ghanaian students in Ukraine, for instance, now the third most popular destination, nearly doubled between 2014 and 2017, largely because of students pursuing low-cost medical education in the Eastern European country. Visa hurdles in the Ukraine are lower for Ghanaians than in most Western destinations, and the cost of living is lower as well, although there have been reports of racial violence. The fact that there is no UIS international student data available for China makes it difficult to compare developments in China to trends in other countries. However, there’s no question that China is becoming an increasingly popular study destination for students from Africa, particularly from Ghana. According to government data released by the Center for Strategic and International Studies (CSIS), the number of Ghanaian students in China has consistently increased since 2011, driven primarily by the availability of scholarship funding. As per this data, Ghana is now the largest African sender of international students to China—there were 5,552 Ghanaian students in the country in 2016 compared with just 1,753 in 2011, an increase of 217 percent in five years. Canada, meanwhile, has also seen a surge in Ghanaian enrollments. Canadian government data show that the number of Ghanaians studying in the country tripled over the past decade, from 465 in 2008 to 1,570 in 2018. This trend is in line with Canada’s emergence as a top international study destination in recent years, chiefly because of the country’s openness and the availability of post-study work opportunities and immigration pathways. Ghana is a popular international study destination in sub-Saharan Africa—only South Africa hosts more international degree students than Ghana (although it should be noted that no comparable data exist for Nigeria). As per UIS data, student inflows from other West African nations to Ghana have surged over the past decade. The number of international students in the country skyrocketed by 838 percent between 2007 and 2015, from 1,899 to 17,821 students. Since then, a downturn in student inflows from Nigeria has helped depress the total number of inbound students to 12,978 by 2017, but inbound mobility in Ghana remains sizable nonetheless. The country’s inbound mobility ratio, that is, the percentage of international students among all tertiary students, is high by international comparison (it stood at 2.8 percent in 2017 according to the UIS). Nigeria is the largest sending country by far, contributing more than 70 percent of international degree-seeking students in Ghana (9,172 students in 2017). When factoring in non-degree-seeking students, that number is even higher. By some accounts, there were between 71,000 and 75,000 Nigerian students in the country as of 2014, injecting considerable funds into Ghana’s economy and education system. According to a former governor of Nigeria’s Central Bank, the money Nigerians recently spent on education in Ghana exceeded the entire federal university budget of Nigeria—a reflection of the poor condition of Nigeria’s education system, which is strained by severe capacity gaps and funding shortages. Given the extreme difficulties in gaining access to quality universities in Nigeria, Ghana has become an increasingly viable alternative for many Nigerians, especially since the country is less costly and closer to home than study destinations like Australia, Canada, China, or the United States. As observers have noted, “… many Nigerians schooling in Ghana see the country’s education system as a rescue option from many months of strike and complicated admission process into university, compared to Ghanaian universities….” In 2017, Ghana was the fourth most popular destination country for Nigerian degree students, right after the U.K., the U.S., and Malaysia. Aside from Nigeria, all other top sending countries of international students in Ghana are located in West Africa as well. Gabon ranked second with 509 degree-seeking students in 2017, followed by Côte d’Ivoire, the Republic of the Congo, and Benin with 434, 426, and 273 students, respectively. The only non-African country sending a significant number of students to Ghana is the U.S., which was the sixth-largest sending country with 216 students in 2017. As per Open Doors, Ghana is also the second most popular destination of U.S. students for study abroad exchange programs in Africa after South Africa. Ghana has been a pioneer in modern mass education in West Africa. First introduced in Christian missionary schools and colonial government schools, most notably in coastal areas during the period of formal British rule after 1867, modern European-style education was greatly expanded by Ghana’s government after achieving independence in 1957. The introduction of free and compulsory basic education in 1961 was a veritable milestone achievement that greatly helped advance access to education, as was the founding of the first Ghanaian universities: the University of Ghana, originally established under British rule in 1948; and the Kwame Nkrumah University of Science and Technology (KNUST) opened in 1952. Between 1960 and 1967 alone, the number of children enrolled in public elementary schools more than doubled. Estimated at less than 20 percent at the time of independence, Ghana’s adult literacy rate shot up to 58 percent by 2000 . While still small in size, the tertiary education system also expanded tremendously over the past decades. The number of universities increased from just three in 1990 to 70 in 2014, while the tertiary GER skyrocketed from less than 2 percent at the beginning of the 1970s to 16.5 percent in 2015. The total number of tertiary students increased from merely 16,161 in 1980 to 444,000 in 2017 (per UIS data). Ghana is a unitary republic with 10 administrative regions. Some 70 percent of the population lives in the more industrialized southern parts of the country, home to the country’s two largest urbanizations Kumasi (1.5 million people) and the capital city of Accra (1.7 million). Education is centrally administered by the Ministry of Education (MOE) in Accra, which oversees several different agencies, including the Ghana Education Service (GES), responsible for the school system and pre-tertiary technical and vocational education and training (TVET), and the National Council for Tertiary Education (NCTE) in charge of higher education. Guidelines by the MOE and its agencies are implemented locally by government offices in Ghana’s regions, as well as by districts offices. While the GES inspects and supervises institutions and devises curricula and teacher education standards in the school and TVET systems, the NCTE develops performance and quality standards in higher education. It advises the MOE on capacity and funding requirements of the tertiary system and, and coordinates policies and practices between higher education institutions. In addition, there’s a National Accreditation Board (NAB) tasked with ensuring quality in higher education through the mandatory accreditation of academic institutions (discussed in greater detail below). A third body, the National Board for Professional and Technician Examinations (NABPTEX) oversees technical, non-university higher education. It administers graduation examinations and is responsible for the assessment and certification of vocational skills and competences. The academic calendar in higher education runs from August to May, divided into two semesters. In the school system, the academic year also runs from August to May, but final examinations at the end of basic and senior secondary education may take place in June. Ghana’s language of instruction is English, its official national language and the language most commonly spoken in the country. That said, indigenous tongues may be used as an instructional language in elementary education in some regions and the government seeks to preserve indigenous languages by mandating that one of nine major, government-sponsored indigenous languages is a compulsory subject for pupils in elementary education. Ghana’s school system is patterned after the British system, but underwent a number of changes over the past 60 years. Before 1974, for instance, the system was structured into six years of elementary education and four years of secondary education. The select few students who went on to higher education then had to complete a two-year UK-based advanced level (A-level) university-preparatory curriculum before enrolling in three-year undergraduate programs (6+4+2+3). At present, the system is divided into six years of elementary education and three years of junior secondary education (jointly referred to as basic education), followed by three of senior secondary education and standard four-year university programs (6+3+3+4). Basic education until grade nine is compulsory for all Ghanaian children, but senior secondary education is not. After independence, the countries of British West Africa successively transitioned from using U.K.-based school curricula to the examinations format of the regional West African Examinations Council (WAEC). Originally established in the 1950s as a means to “harmonize and standardize pre-university assessment procedures in … British West Africa”, the council is now an international organization with five member states: Ghana, Nigeria, Sierra Leone, the Gambia, as well as Liberia, the only non-British colony to join the council (in 1974). Headquartered in Accra, the WAEC conducts examinations and issues certificates that serve as school leaving certificates and the main university entrance criterion in the different member states. While the WAEC offers the international West African Senior School Certificate Examination (WASSCE) in all member states, other WAEC exams are tailored to specific national needs and only given in particular member states. In Ghana, for example, the WAEC administers the Basic Education Certificate Exam at the end of grade nine at the national level. The Ghanaian WAEC examination, like those in Nigeria and other West African countries, are unfortunately characterized by a relatively high incidence of examinations fraud and cheating, such as the use of cell phones during the exams, the leaking of examination questions. In 2017, for instance, 13,793 takers of the senior secondary exams, or almost 5 percent of all 287,353 test takers, were implicated in some form of exam malpractice. Since 2013, the WAEC is using biometric fingerprint to prevent impostors from sitting for exams, and has created an elaborate scratch card system for the verification of exam results. The use of closed circuit television cameras in test centers in Ghana is planned as well. Elementary education in Ghana begins at the age of six and is nominally free of charge at public schools. However, even public schools charge fees for various items like teaching materials or uniforms, so that education is not entirely free. In fact, according to some estimates, fees at public elementary schools are only 21 percent lower than in private schools – a circumstance that has facilitated the spread of private schools, particularly in rural areas where governmental provision is lacking. The percentage of children enrolled in private elementary schools increased from 13 percent in 1999 to 28 percent in 2018 (per UIS data). The elementary school curriculum focuses on developing basic reading and writing abilities, arithmetic and problem solving skills. The subjects taught include English, local languages in early grades, mathematics, social studies, integrated science, arts, physical education and civics. Elementary education concludes with the completion of grade six. Junior secondary education is open to all students who complete elementary education – there are no entrance examinations. It lasts three years (grades seven to nine, or forms I to III) and concludes with the Basic Education Certificate Exam (BECE). Conducted by the WAEC in June each year for ninth graders who have been approved by the Ghana Education Service to sit for it, the BECE subjects include English, Ghanaian language and culture, social studies, integrated science, mathematics, design and technology, religion and civics, information technology, as well as French as an optional subject. In 2017, 468,053 students in Ghana sat for the BECE – a sizeable increase over 422,946 in 2014. The final grade average of the Basic Education Certificate is based to 70 percent on test performance, whereas continuous school assessment accounts for 30 percent of the final grade. WAEC uses a nine-point numerical grading scale with 1 being the highest and 9 the lowest possible grade. There’s no hard failing grade – the grading system is flexible with 9 simply being interpreted as “lowest grade”. However, the exams are nevertheless highly important since the BECE grade average determines the eligibility for admission into senior secondary school. The vast majority of graduates from basic education who wish to continue education get assigned to senior secondary schools based on a “computerized school selection placement system”. Admission is competitive and only good students have the option to choose the school they wish to attend. In 2017, about one third of BECE test takers did not score high enough grades in 2017 to be admitted to schools of their choice; only 8 percent did not have high enough grades to be placed at all. While there have been some attempts in recent years to extend senior secondary education to four years to give students more time to prepare for the final examinations, these reforms have faltered and upper-secondary education in Ghana continues to lasts three years (from grades 10 to 12). The curriculum includes mandatory core subjects and electives from the following specialization streams: General (with separate arts and science options), agriculture and environmental studies, business, vocational, and technical. Senior secondary school graduation examinations are conducted by the WAEC. Since 2007, Ghana has switched from the national senior secondary school certificate examination to the pan-regional West African Senior School Certificate Examination (WASSCE). Eligible candidates are registered to sit for the exams in May/June by the relevant school authorities, but private candidates may also register independently (for a separate examination in October/November). The examinations include multiple choice questions as well as essays. They cover four mandatory core subjects – English, integrated science mathematics and social sciences. In addition candidates are examined in subjects from their respective specialization track, including three to four electives. To name two examples, candidates in the general science track can choose between Christian studies, economics, geography, government, history, economics, English literature, Islamic studies, mathematics or music, whereas candidates that elect accounting under the business track are examined in business management and financial accounting, as we all as one chosen subject from typewriting, cost accounting, French or music, economics and further mathematics (see the WAEC website for more information on the different options). The eight-grade scale used to grade the exams is listed below. Forty percent is the minimum passing percentage in each subject; top grades are very difficult to achieve – in 2018, more than 62 percent of 315,621 test takers failed to score C6 or above in at least three core subjects – the minimums standard for admission into university. Grades awarded tend to be highest in social studies and lowest in mathematics. In 2017, 73 percent of Ghanaian candidates scored within the top five grades (A1 to C6), but only 38 percent scored within that range in mathematics. Cheating also continues to be a problem: In 2018, the examination results of 26,434 students were withheld due to examination malpractice. In addition to vocational senior-secondary WAEC curricula, there are several formal TVET programs in Ghana offered by pre-tertiary technical institutes under supervision of the GES, private vocational schools and TVET centers run by Ghana’s National Vocational Training Institute (NVTI). Students who have completed basic education or have adequate work experience can complete applied programs that combine classroom instruction with practical apprenticeship training to earn a qualification in trades like carpentry, masonry, automotive technology, hairdressing or photography. A Foundation Certificate is earned after two years, the Technician Certificate I after three years, and the Technician Certificate II after four years. Holders of the Technician Certificate have the option to enroll in tertiary programs at polytechnics. Overall, however, Ghana’s non-tertiary TVET sector is considered ineffective by most observers – the number of TVET institutions is small and the quality of training and facilities is inadequate, so that TVET has a poor reputation in Ghana. Merely one percent of all Ghanaian students under the age of 25 were enrolled in TVET programs as of 2016. While university admissions criteria in Ghana may vary somewhat by institution, the baseline admission requirements for all providers are set by the National Accreditation Board. All candidates must have a minimum grade of 6 in at least three WASSCE core subjects, as well as in three elective WASSCE subjects. Given the surging demand for higher education in Ghana, admission is highly competitive, especially at top public universities. Some institutions may require that applicants have completed elective courses related to their intended major and may have additional entrance examinations – a practice that is also common for mature students opting for higher education at a later age. Admission requirements at polytechnics and private HEIs tend to be lower than at public universities. In fact, there have been repeated claims that private universities are admitting unqualified students – Ghana’s National Accreditation Board in 2011 alleged that private universities had admitted hundreds, if not thousands of students that did not meet the mandatory minimum requirements and threatened to bar these students from graduating. In 2018, the Ghanaian Ministry of Education made similar complaints. Ghana’s higher education sector has mushroomed in recent years. Tertiary enrollments doubled between 2009 and 2015 alone, jumping from 203,337 students to 417,534 students within just six years (UIS data). Like in other African countries, this expansion has been accompanied by a rapid growth of the private sector – the number of private HEIs increased from just two private universities in 1999 to 81 private universities and colleges today. In general, the surging demand for education makes it increasingly difficult for the Ghanaian system to effectively provide mass education while maintaining quality standards. Consider that a shortage of qualified instructors, for instance, has caused teacher-to-student ratios in popular disciplines like business to soar to 161 to 1 as of 2017. The types of higher education institutions in Ghana include 10 public universities, eight technical universities, and seven university-level professional training institutions. While the NAB defines universities as multi-faculty institutions dedicated to “advanced instruction and research in several branches of learning, conferring degrees in various faculties, and often embodying colleges, schools and similar institutions”, technical universities and professional institutions are more narrowly specialized in particular disciplines. A number of larger public universities, such as the University of Energy and Natural Resources and the University of Education, Winneba, also have a more specialized focus. The public University of Ghana (with about 38,000 students), KNUST (42,000 students) and the University of Cape Coast (close to 75,000 students) are among the most prominent institutions in the country. The only Ghanaian institution currently listed among the top 1,000 in popular international university rankings is the University of Ghana, featured in the 801-1,000 ranking bracket in the Times Higher Education World University Ranking. In addition to universities, there are various teacher training colleges, nursing colleges and university colleges that do not have standalone degree-awarding authority, but offer undergraduate programs in affiliation with universities, which are often undergraduate programs geared towards employment. According to the OECD, about 23 percent of Ghana’s public sector students were enrolled in polytechnics in 2011, compared with 14 percent at teacher training colleges and 62 percent at universities. Polytechnics, of which there is one in each of Ghana’s ten regions, have diversified in recent years – they’re increasingly offering programs similar to university programs in disciplines like liberal arts in addition to technical programs. In an attempt to strengthen tertiary vocational education, he Ghanaian government recently elevated eight polytechnics to technical universities which can award bachelor’s and master’s degrees. The vast majority of private HEIs are university colleges. One reason for this is that private institutions are required to initially start operations as affiliated colleges under the “mentorship” of public universities. At present, there are 81 accredited private institutions in Ghana, but only four of them – Ashesi University, Central University, the Trinity Theological Seminary and Valley View University – have been officially chartered as independent degree-granting institutions. Many, but not all private HEIs are smaller providers of lesser quality that absorb excess demand by students locked out of the competitive and more highly regarded public sector. The percentage of tertiary Ghanaian students enrolled in private institutions has increased from 13 to 20 percent between 2007 and 2012, before dropping down to 16 percent by 2017, per UNESCO. In response to the rapid growth of the higher education system and the increase of education providers in Ghana, the government in 1993 created the NAB in an effort to ensure quality. All institutions in Ghana, public or private, must be accredited by the board, which also approves the establishment of any new HEIs. New institutions must apply for an initial three-year interim permit to offer programs under the supervision of an affiliating university and undergo annual performance reviews by the “mentoring” university. Private HEIs are only permitted to obtain chartered degree-granting status after ten years of operation as university colleges, as long as they deliver programs of sufficient quality and have adequate facilities and teaching staff (for more information, see the NAB website). NAB accreditation is granted for five-year periods based on NAB site inspections and criteria like enrollment numbers, teacher-to-student ratios and research output. Institutions without NAB accreditation are not allowed to offer academic programs in Ghana, but there are nevertheless various HEIs in Ghana that operate without permission. In 2018, the NAB charged that there were almost 50 illegal academic institutions operating without approval across Ghana. A list of illegal institutions, as well as a directory of accredited institutions and programs is available on the board’s website. Ghana’s public education expenditures are substantial – over the past 15 years, the country spent more on education as a percentage of GDP than both the global average and the average in sub-Saharan Africa, the latter of which ranged from 3.8 percent to 4.6 percent in the current decade (as per World Bank data). Ghana’s expenditures, by comparison, have been well above 5 percent since 2001, peaking at 7.4 percent and 8.1 percent in 2005 and 2011, respectively, before finally dropping to 4.5 percent in 2017. That said, much of the public spending is “largely for recurrent payments in wages and salaries, among others, instead of for investment in infrastructure, teaching and learning aids”. Elementary and secondary education consume most of the budget and the introduction of tuition-free senior secondary education will sap considerable funds in the near-term future, so that there are presently few financial resources available for major reforms in tertiary education. Ghana has a binary qualifications structure that includes applied Higher National Diploma programs offered mostly by polytechnics (respectively technical universities), as well as bachelors, masters and doctoral degrees offered by universities. According to statistics provided by the NAB, the vast majority – 70.5 percent – of students at public HEIs were enrolled in bachelor’s programs, whereas 22.4 percent studied for diplomas, the latter overwhelmingly in distance education mode. Enrollments in graduate programs were comparatively small – only 6.3 percent and 0.5 percent were enrolled in masters and doctoral programs, respectively, in the 2015/16 academic year. Overall, the introduction of free senior secondary education is expected to help boost the number of students entering higher education programs from 90,000 in 2018 to 145,000 by 2020. Ghana’s 1992 polytechnic law established polytechnics as tertiary education institutions to provide technical education in the fields of “manufacturing, commerce, science, technology, applied social science, applied arts” and similar disciplines. As mentioned before, most polytechnics have recently been further upgraded to the status of technical universities. While these institutions (and other types of HEIs) offer a variety of certificate and diploma programs of one- to three-year duration, the most common credential awarded by polytechnics (respectively technical universities) is the Higher National Diploma (HND) – most commonly a three-year 12+3 qualification designed to train skilled technicians for mid-level managerial positions. While HND programs are taught at polytechnics, they are externally assessed by Ghana’s National Board for Professional and Technician Examinations (NABPTEX), which conducts the final graduation examination and also issues the final diploma. NABPTEX currently awards HNDs in 15 disciplines, including accounting, agricultural engineering, civil engineering and computer science. HND graduates with sufficiently high grades may be eligible to transfer into the third or fourth year of university bachelor programs in related disciplines. Technical universities also offer top-up programs that allow HND graduates to earn a Bachelor of Technology after one or one and one-half years of further study. Grading scales used by Ghanaian HEIs were traditionally patterned after the British classifications scheme, but almost all universities now use variations of U.S.-style 0-100 and A to F grading scales. 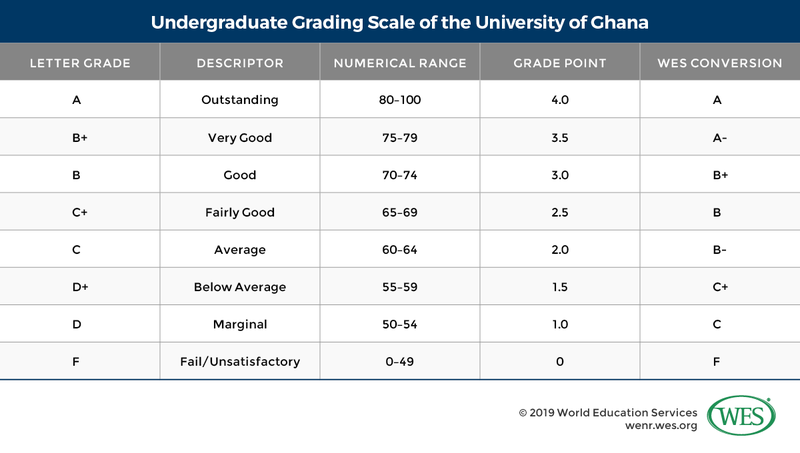 The University of Ghana, for example, currently uses the undergraduate grading scale shown below. Under this scale, a minimum GPA of 1.0 is required for graduation in bachelor’s programs. Universities usually use a course numbering system that labels undergraduate courses as 100, 200, 300 and 400-level courses, depending on the year of study (first year, second year and so on). Akin to the U.S. credit system, one fulltime academic year usually represents 30 to 36 credit units. Bachelor’s degrees in standard academic disciplines are four years in length (12+4), whereas bachelor programs in professional fields like architecture, medicine or dentistry are five or six years in length after the WASSCE. Curricula are specialized with few if any general education requirements. Programs commonly include a final project, thesis, “long essay” or “special paper” in the final year. Typical credential names include the Bachelor of Arts, Bachelor of Commerce, Bachelor of Science and so on. Postgraduate diplomas are one-year programs after the bachelor’s degree designed for further specialization in professionally oriented disciplines. There’s usually little articulation between PGD and master programs – PGDs are primarily intended to give access to employment rather than further study. Admission into master’s programs is based on a bachelor’s degree with sufficiently high grades in a related field. Programs are between one and two years in length; thesis and non-thesis options do exist, with the latter typically requiring more coursework. Common credential names include the Master of Arts and Master of Science. The Master of Philosophy is a special degree typically earned after completion of a rigorous two-year research-oriented program. A terminal research degree, the Doctor of Philosophy is Ghana’s highest academic qualification. While the occasional structured program does exist, doctoral degrees are usually earned by research and defense of a dissertation without further coursework. Admission is based on a relevant master’s degree and academic potential. Ghana’s medical system has evolved significantly in recent years – whereas critical medical care was still routinely provided by visiting European medical doctors just a few decades ago, Ghana has now built up a more effective domestic health care system, even though the outmigration of trained physicians remains high and severe shortages of physicians persist, particularly outside of metropolitan areas. Medical training takes six years after the WASSCE and concludes with the award of the Bachelor of Medicine and Bachelor of Surgery (MB ChB). The most common curriculum offered by Ghanaian universities is divided into two phases: In the first phase students complete one year of pre-medical sciences and two years of basic medical and para-clinical studies before they are awarded a bachelor’s degree in medical sciences en passant. The second phase comprises three years of clinical studies. Admission is extremely competitive with only the most qualified students gaining admission. In addition, there’s graduate entry medical program (GEMP), which is a four-year integrated program for holders of previous bachelor’s degree in fields like pharmacy, nursing, or natural sciences (biology, chemistry, physics and so on). Graduates of both types of programs must complete a mandatory two-year internship (“housemanship”) before being able to register as physicians with the Ghana Medical and Dental Council. Graduate medical education is provided by the Ghana College of Physicians and Surgeons and usually involves another two to four years of clinical studies, depending on the specialty. Until recently, it was possible to teach at the elementary and junior secondary level (basic education) in Ghana on the basis of a three-year Diploma in Basic Education (DBE). However, the government is currently implementing major reforms in teacher education and has mandated that all teachers must have a four-year bachelor’s degree in an effort to raise teaching standards. In 2018, Ghana’s President, Addo Dankwa Akufo-Addo announced that all colleges of education, the main provider of DBE programs, “will be upgraded to University Colleges and will offer a four-year Bachelor of Education degree with effect from the 2018-19 academic year”. The new degrees will initially be awarded by the University of Cape Coast, as well as by other affiliated public universities at a later stage. In another change, teachers are now required to obtain a formal license from the MOE and complete one-year of assessed in-service teaching training before being granted a teaching permit. Data provided by the UNESCO Institute of Statistics. Data for Nigeria is from 2016, data for Pakistan from 2017. Now known as the Association of Graduates in Skills Development–Ghana. When comparing international student numbers, it is important to note that numbers provided by different agencies and governments vary because of differences in data capture methodology, definitions of “international student,” and types of mobility captured (credit, degree, etc.). The data of the UNESCO Institute Statistics provides the most reliable point of reference for comparison since it is compiled according to one standard method. It should be pointed out, however, that it only includes students enrolled in tertiary degree programs. It does not include students on shorter study abroad exchanges, or those enrolled at the secondary level or in short-term language training programs, for instance.